In learning, a man keeps watch on the whole condition, and then finds out the solution. Under this theory, in the process of learning, there is an internal insight for succeeding in the solution of any problem. Gestaltists talk about the memory symbol, these memory symbols are totally collected. These memory symbols go on changing from one situation to another; these changes can be brought by thought or time interval, the way in which they are recollected, it is related to Gestalt learning. Famous Gestaltist Kohlar has presented the insight theory of learning, in which relation the following things are stated. German native Wolfgang Kohler was sent to Teneriffe situated in Canary island for the study of human psychology in 1913 by an organization “Prussian Academy of Science’’,where he studied the chimpanzees extensively in places that were desolated in the beginning of first world war. He has presented this description in his book ‘Mentality of Apes’ in 1925. In this book he has presented his theory of insight on the basis of the outcomes of many experiments done on the apes. The important element of his theory is insight, so it is necessary to understand insight. Learning by Insight—According to Kohler a man cannot learn by the trial and error, but first he does the direct observation of problematic situation through his mental strength and intellect. Then he does some responses. The learning process happens on the basis of alternative presentation of whole situations. When a man comes under a situation, he establishes relationship with the different elements and things and does conditioned responses after understanding the whole situation very well. It is the indication of insight to have the understanding of all the situation and then reacting. So this is called learning by insight, which we give the name of internal sight. In the learning by insight, first a man observes the entire situation and then establishes the connection between problem and situation. After watching the problem and situation and doing efforts suddenly he gets the result, although he gets success after a period of trial and error behavior yet this behavior is not the useless trial and error. It is the direct effort of definite and problem centric solution. All efforts of the solving a problem are connected to one another and help in the changing and organizing of proper behavior. After some efforts, the insight of sudden solution comes in a man. A learner feels helplessness before insight, but he becomes expert after finding the solution of one problem by insight. Thus, learning by insight moves towards the skillfulness from helplessness. Skillfulness learnt by insight can be repeated and transformed under the new situation. High level of solving a problem and capability of good transformation also come in a man. Insight depends upon the understanding, which is connected to the intellectual level. More insight is seen in the creature of higher level than that of low level. Insights also affect the period of learning. The insight is also affected by experience in learning. However more experience does not mean more insight. 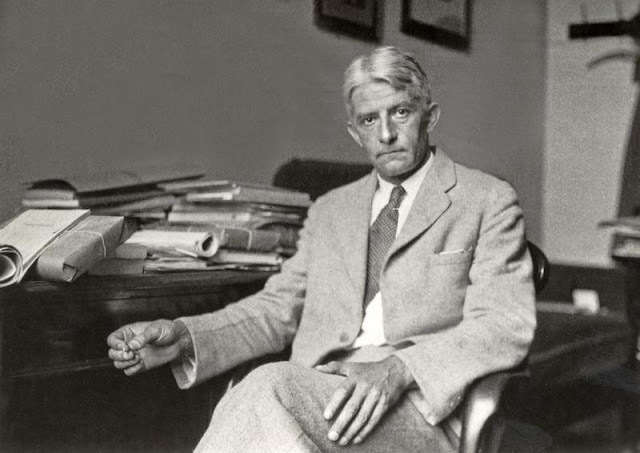 By the experiments of Kohler, his insight theory can be evidently understood. He did many experiments on the chimpanzee in the Tenerife Island. Kohler started his experiment by keeping six apes in the cage of wood. There was an intelligent ape among them who was named Sultan by Kohler, and mostly experiments done on Sultan. Kohler presented two types of problem in front of Sultan. Stick problem and Box problem. 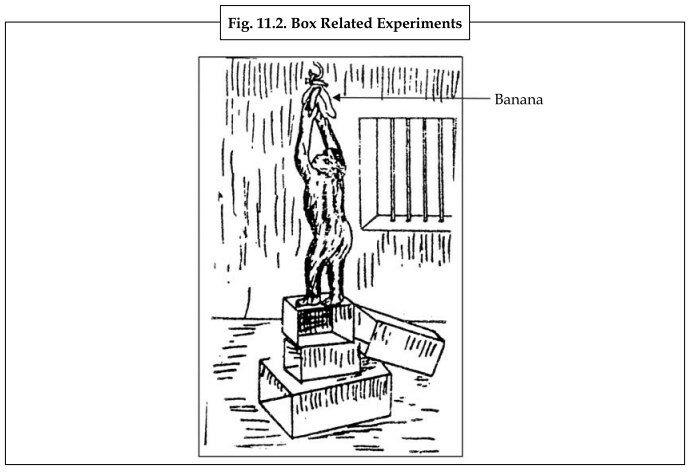 Stick Problem Related Experiments—A chimpanzee was kept in a cage and a Sharp Stick was put by it side and bananas were put outside of the cage, which he could not get by stretching his hands out. Chimpanzee first tried to get the banana by spreading its limbs but he could not get the banana. After some time he picked up the stick lying by the side of cage and pulled the bananas with the help of it. He was satisfied after getting the bananas. After using the sticks he got the bananas, which was the outcome of his insight. After this Kohler put two sticks in the cage which could be made longer by fitting into each other. Bananas were kept outside of the cage at a distance. Hungry ape tried to get them after spreading the hands but being failed he tried to get the bananas by a stick—Again he could not get success, then he started to play with the both sticks suddenly the one side of the stick was fitted with the another side of it. And after the joining of one stick with the other, it became longer. He got success in getting the bananas like earlier. In the second day again an ape was kept in the same condition, and it was seen that after joining the sticks soon he pulled up the bananas without wasting the times. Ape got this insight suddenly. Before getting the insight, ape tried to establish the connection among the conditions of the cage, the distance of bananas and the length of stick and got the goal after resolving the problem by insight. Box Problem Related Experiments—In the Box related experiment Kohler kept Sultan in a cage. A bunch of bananas was hung from the ceiling of the cage and a wooden box was kept in the cage. Bananas were out of it reached. First he tried to get the banana after leaping and springing but could not get success. And he wandered here and there in the cage and kept on watching on the box, suddenly he pulled the box under the hanging bananas and climbing upon the box he got success in getting the bananas. Second day again a hungry ape was kept inside the cage but this time the bananas were on the more height. And there were two boxes in the cage. After wandering to and fro he came to the boxes and after pulling up the box he brought it right under the bananas, yet he could not get it. Then he put the second box upon the first box and got the bananas after climbing on it. Here ape established the connection between the two boxes. In this way three boxes by putting on one another, Ape learnt to get the bananas. A human being at the perceptual level, with the help of sense organ and after having the perceptual knowledge of entire situation, does reaction and then he learns. A man is thoughtful and wise by the insight. So he watches troublesome situation entirely and finds out the solution of his problem soon. We can say that the process of learning is at the perceptual level in the experiment related to the boxes. In the process of learning at the conceptual level mind helps, when some complicated situation is originated in front of any one and he has to take the support of intellect with the physical capabilities. Kohler’s stick related experiment indicates it. The observation of entire situation and problem—After studying the whole thing, the whole situation is known. Intellect—There is more capability of insight in intelligent people. And in the dull minded people, less capability is found. Trial and Error—In the process of doing trial and error, suddenly an insight is produced. Experience—According to this theory, there is a transformation of experiences in learning. This experience after being organized adopts the form of Gestalt or whole. As a chimpanzee did many unsuccessful efforts to get the bananas after climbing upon the box and did not succeed, then putting one box upon another and got the success. In this way a man makes rules on the basis of watching, trial and error and all past experiences, and after organizing them Gestalts are prepared. Thus it can be said that learning by insight is a high level learning, because it includes mental efforts, and there is the use of intellect and imagination in it. A man learns after observing the condition on high intellectual level and understanding and reacting to the entire aspect of problem. Here, it is proper to say that the learning method by insight has been hidden in the method of learning by trial and error. In resolving any problem, not only insight works but thinking and trial also used. For example- during the time of resolving math problem effort and insight both work. Then result comes. Difference between the learning method of ‘Trial and Error’ and ‘Insight’—In short, the following differences are found between both learning method. Trial and Error method focused on the motor skill due to depending on the motor level, while in the learning by insight the use of mind and intellectual skill is more focused. Every one can use Trial and error method, but common intellectual level is needed for the use of insight method. Trial and error method especially depends on the exercise, inspiration and emotion, while insight method depends on observation. Trial and error method depends on the practice and hard work, while the insight method the solution of problem comes suddenly. In Trial and Error method, each time new effort has to be done in a new way for the new problem, while in insight method problems are resolved in the absence of practice. In trial and error method the focus of a man is towards the goal ,while in insight method, the unconscious mind is more active- conscious activities happen less. In trial and error method mastery comes slowly, while in insight method mastery comes quickly. Trial and error method is useful for learning any skillfulness in sequence, while in the solution of any problem insight method is more useful. It can be said in the conclusion that as the trial and error method cannot be used in the all levels of learning, in the same way insight method is not completely faultless. In fact both the methods should be used in the learning according to the situation.